This entry was posted in Manners, Traditions, and Etiquette and tagged agrarianism, culture preservation, education, family, life style, old school. Bookmark the permalink. The idea is to eliminate not prejudice but individuality. Anything that fosters the hive is preferred over that which favors the individual. The individual cannot be constrained nor controlled and that is why everything must be reduced to the lowest common denominator for then it is easier to “work with” – that is, control. Of course, this doesn’t apply to the elites who will rule us. One imagines that THEIR children are taught rather than indoctrinated. I didn’t know that handwriting wasn’t taught in school anymore. I wonder if everything is the fault of the school system, though. I have a child who I taught handwriting to, and he simply does not want to use it. He prefers to print, he is just naturally attracted to that. He will write when he absolutely has to (endorse a cheque; write a thank you note) but that’s it. He likes computers. I think kids’ brains are developing differently nowadays, I really do. It may not be just what you are exposed to or formally taught. I found some old report cards from when I went to school in the 1950s. I was amazed at the beautiful handwriting of the teachers who filled them out. Have you seen what passes for “handwriting” from teachers now? The worst, most unreadable, incomprehensible chicken scratching ever. Also, I don’t see hand printing as being uniform. Everyone prints a little differently, too. I can’t print worth a darn but I studied calligraphy in my 30s so can decently write Italic as well as self-taught copperplate [this is HARD!] if I really concentrate. So, we are all a little different. 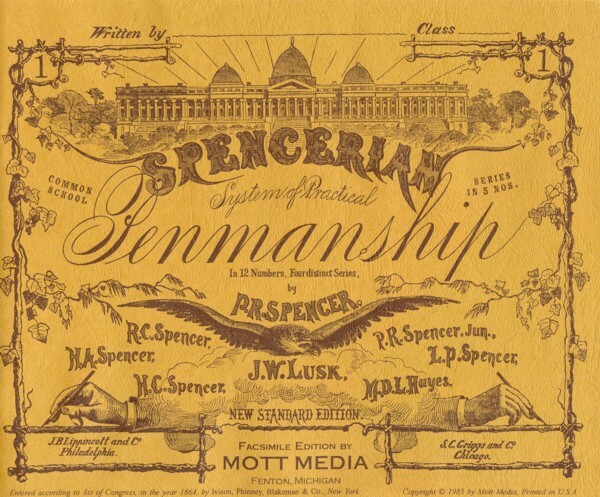 Spencerian, which is what we learned in school, is not really the same as copperplate. FWIW. Can I ask why any of you are publishing and/or commenting on a website instead of a handwritten pamphlet if you are so against non-quill writing? I mean, I guess you could reference the great Walt Whitman regarding being full contradiction, but perhaps you wouldn’t since he was gay and whole-heartedly against the values of your fantasy bygone era. Should we write computer code with quills? Should all adults who write words with an instrument other than a computer (some of us prefer mechanical pens) write ONLY in cursive? Are those that write with print letters or, God forbid, a hybrid of print and cursive or maybe even unintelligible script–are those people consigned to everlasting hell? I’m generally confused about the teleology of your argument…. No, “sps”, you are not “generally confused”. You are willfully ignorant – or at least that is the way you wrote your reply. There is no way that the original post that I wrote can even come close to your “interpretation” of it. Your replies to another post here demonstrate that same hostile stupidity, and the popular word for someone like you is “troll”. You need not waste your time with any further replies on this blog – they will not be published. I learned how to write in cursive at a very young age in the second grade. I switched schools when I moved up to the third grade, and that was the grade that students at that school learned cursive. I already had a head start on the technique than most of our youth at that time. I did not grow fond of cursive handwriting until middle school. I found that writing in cursive made writing much faster and more productive for my schoolwork. I also discovered that compared to my cursive, my print is horrible. Throughout my high school years, I greatly worked on fine-tuning my handwriting. I have received many compliments on my penmanship and have noticed that an individual’s style of handwriting is ever-changing. My current style of handwriting may be somewhat different five to ten years from now. If cursive handwriting is to be a thing of the past in our school system, I will be sure to teach it to my child(ren) as it is a great way to express one’s individuality. The ability to write in cursive with good penmanship says a lot about a person’s personality. I do identify myself as a redneck most of the time. 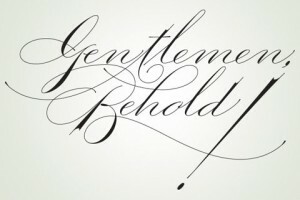 However, my penmanship does show that I can appropriately be a Southern gentleman when I need to be. Thank you for this insightful article, Colonel McGehee. I am glad people still care about the art of good penmanship and are concerned about its absence in today’s generation. Thank you for writing. You said you, “noticed that an individual’s style of handwriting is ever-changing. My current style of handwriting may be somewhat different five to ten years from now.” That is absolutely right – at least in my case. It is something that becomes very apparent to me as I look back at my signature over the years. As you said, it says a lot about a person’s personality. I have, over about the past decade, paid closer attention to my signature. As a teenager, I signed my Social Security card “Steve McGehee”. Later, I went to “Stephen McGehee” since that is the name I was given at birth and wanted to honor my parent’s choice of a name. Then, as the world of the Internet opened up, I learned that my first and last names were not as unique as I thought they were. There are others in the world named “Stephen McGehee”. At that point, I began using my full name – “Stephen Clay McGehee” (which, as far as I can tell, no one else currently uses). I wanted to make sure that there was no mistaken identification. It was not just the names used in my signature though. As I became more aware of the significance of one’s signature, I began to appreciate the fact that a signature represents an individual, and as such, a signature deserves an extra bit of care. It’s a bit like making sure that your shoes are polished – scuffed up shoes are perfectly functional, as is any legible signature; however, polished shoes (like a well-written signature) makes a bit of a statement about the person. I have tried to add a little flourish here and there to make it more distinctive than those same letters used when writing something else – nothing ostentatious or pretentious – just something to add a bit of uniqueness and character to the letters. Hello, I was thrilled to see your post on the subject of handwriting. I have been concerned about the lack of cursive writing skills in younger people today. It is depressing to think about what is being taught (and NOT taught) in American schools these days! I applaud your article. I favour the use of a fountain pen with a flexible nib myself since it allows for more expression in handwriting. Being on the downhill side of 50, and being raised well south of the Mason-Dixon line I may be one of the last generations to be taught penmanship in grade school. I recently read the best reason for sending personal, hand written correspondence: In continuing this art, you are saying to the recipient that you care enough for them to give them the thirty or forty-five minutes of your life that it took to compose and write the letter. In this age of multi-tasking and high demands on all our time that is a significant gift indeed. In continuing this art, you are saying to the recipient that you care enough for them to give them the thirty or forty-five minutes of your life that it took to compose and write the letter. In this age of multi-tasking and high demands on all our time that is a significant gift indeed. What an excellent description – and said so eloquently in so few words! When my late father first applied for what would become his life-long career as a meteorologist, the application process included a handwriting test. If you couldn’t write cursive in a clear and legible manner, then you were eliminated from consideration. When he died, I inherited his Esterbrook fountain pen that he used for so many years. It was in fairly rough shape, so I sent it to a place that refurbishes fountain pens. It is now in beautiful shape, with a new ink bladder. My regular writing instrument is a Pelikan Souveran – an excellent pen and a good value. One of the things I love about fountain pens is the ability to select from a huge variety of inks. Unless someone were to find out exactly which ink I use, my signature cannot be duplicated since I know what color and shade my ink is.